This well-regarded Bluetooth speaker is currently available for an even better price than usual. 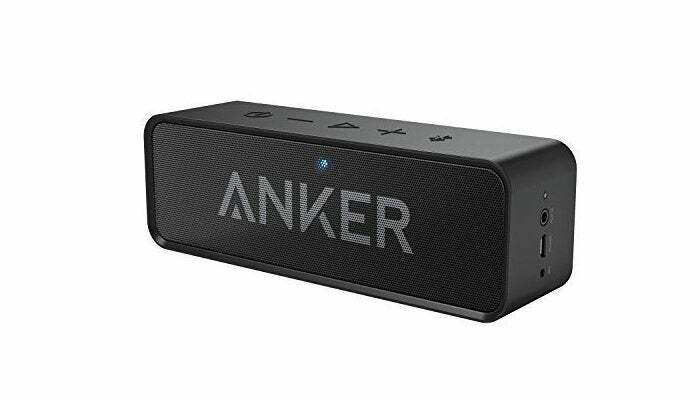 The Northern Hemisphere is warming up as summer approaches, and Amazon and Anker have a deal today to gear up for blasting tunes in the backyard. Right now, Anker’s ultra-popular SoundCore Bluetooth speaker is on sale for $28.79 at Amazon when you apply coupon code ANKSPK77 at checkout. That price is within spitting distance of last fall’s all-time low of $27, and in general a very good price for this budget speaker. The SoundCore features two 3-watt speakers and a built-in microphone for hands-free calling, and supports both Bluetooth 4.0 and an auxiliary line-in connection. It has a reception range of 66 feet, and a 24-hour/500 song playtime on a single charge from the 4400mAh battery. It’s also fairly light and compact, weighing 0.78 pounds and measuring 6.5 x 1.5 x 2.1 inches. Anker claims that the dual-high performance drivers and a spiral bass port allow for less than one percent harmonic distortion in audio output, resulting in better clarity and fidelity. Our informal use of a SoundCore mostly backs up this claim—the speaker does produce loud and clear audio. You don’t get much bass at all, however, which makes music sound a little sterile. But for a speaker under $30, we much prefer sterile and clear. It'd be far worse to have distorted or muddy lows. There is one tiny catch with this deal—the coupon code only works for the Black version. If you can live with such a generic color, though, today’s deal should make a nice gift. Even if it’s to yourself.